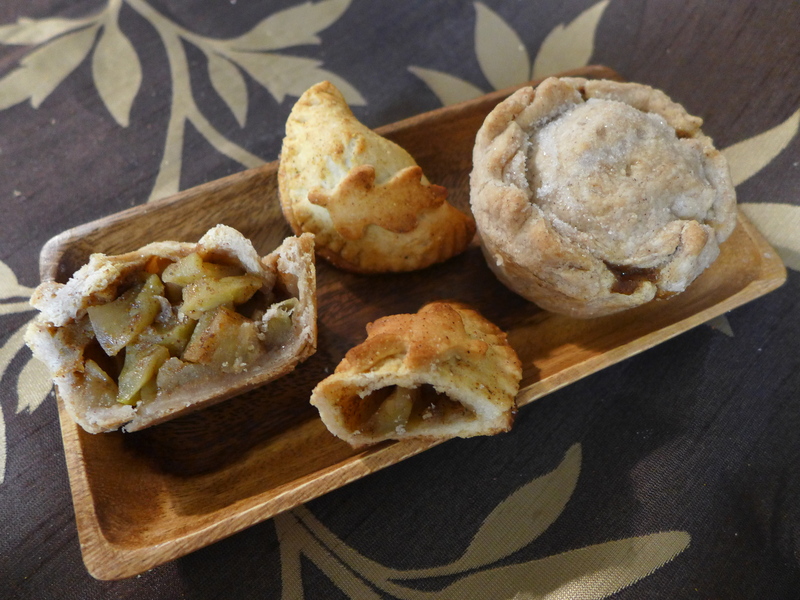 These petite apple pies can be enjoyed either as a hearty vegetarian breakfast when visiting Beorn or as a durable teatime treat capable of keeping their shape after bumping around in your pack for a few days. Peel and core the tart green apples of your choice. Cut the apples into a small dice. The smaller you cut them, the more filling you can pack into each pie. To make the crust, first mix the flour, sugar, salt, and cinnamon until well blended. Add the room temperature butter and work it into the flour mix using your fingers. Keep at it until your flour looks like a crumbly pie topping, or really attractive gravel. The cold water will magically bind all those loose rocks together into a pie crust. Knead it a few times for good measure. You can now make your pies in two shapes. Either way, start by sprinkling flour on a clean surface and rolling the dough out to ¼ inch thickness. Don’t go much thinner or they’ll be prone to falling apart after one bite. 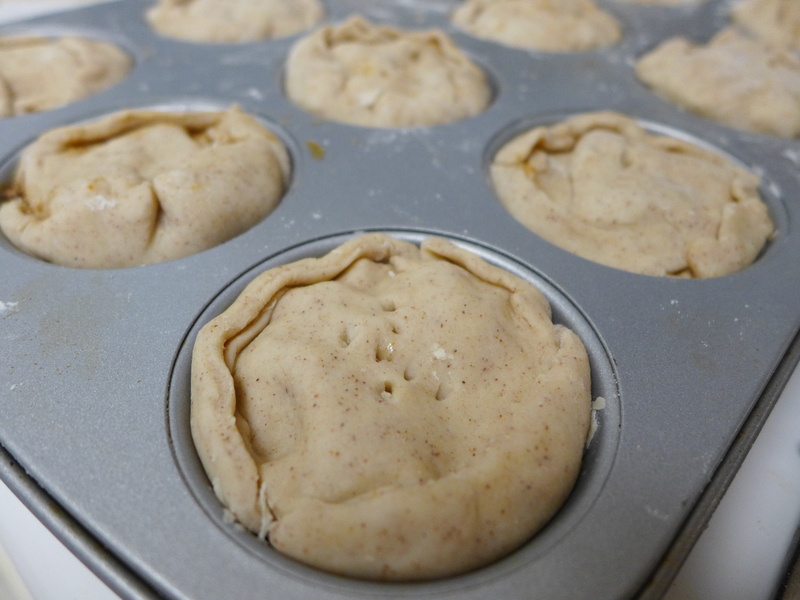 To make a large, cupcake sized hand pies, start by generously greasing the cupcake tins with butter. Remember, this isn’t health food. You want these to slide right out with ease while also gaining a little extra crispy flavor. 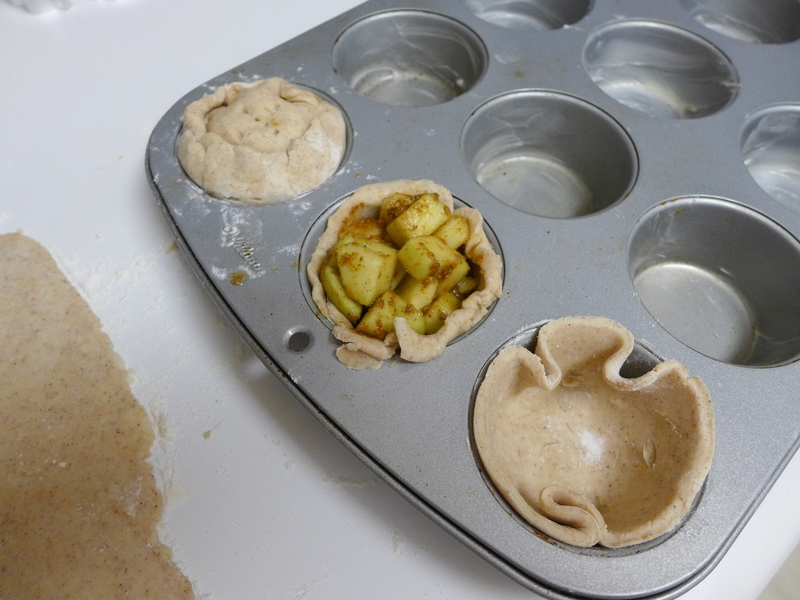 Use a cookie cutter (or martini glass, or bowl) about 2 inches bigger around than your cupcake tin holes. Press the large round piece into a tin. Make sure a little bit hangs over the top. Poke a couple vent holes in the bottom. 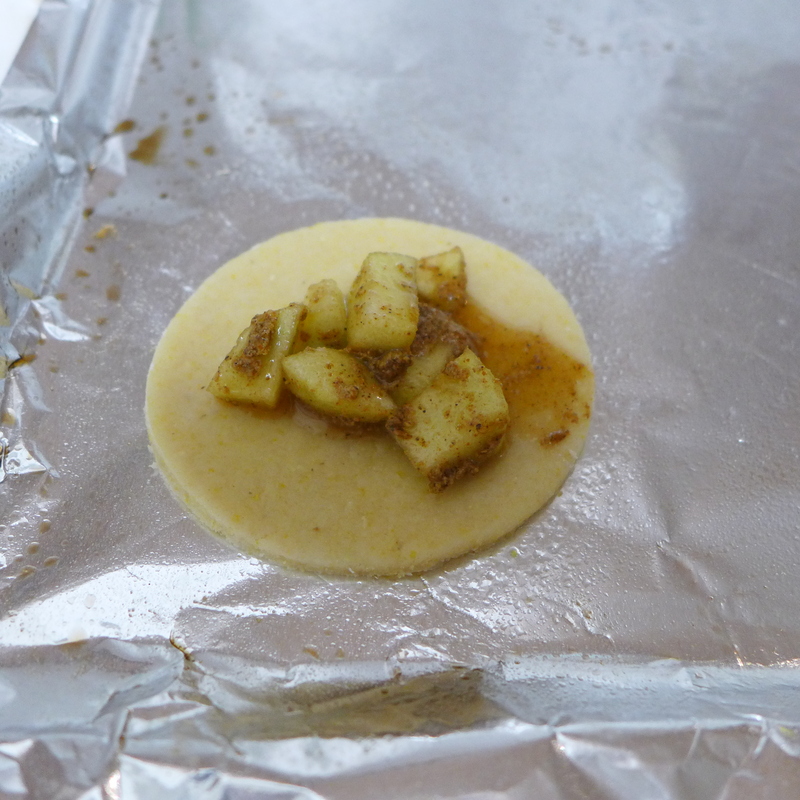 Now spoon apple filling up to the top of your cupcake tin. Cut out a second circle of dough just a smidge thinner than the open top of your cupcake tin. Lay it on top of the filling. Pinch the overhanging filling around the top crust. Bake the cupcake sized hand pies at 400F for 45-50 min or until golden brown. If you prefer the bite sized teatime pies, simply cut out a flat disc of dough. 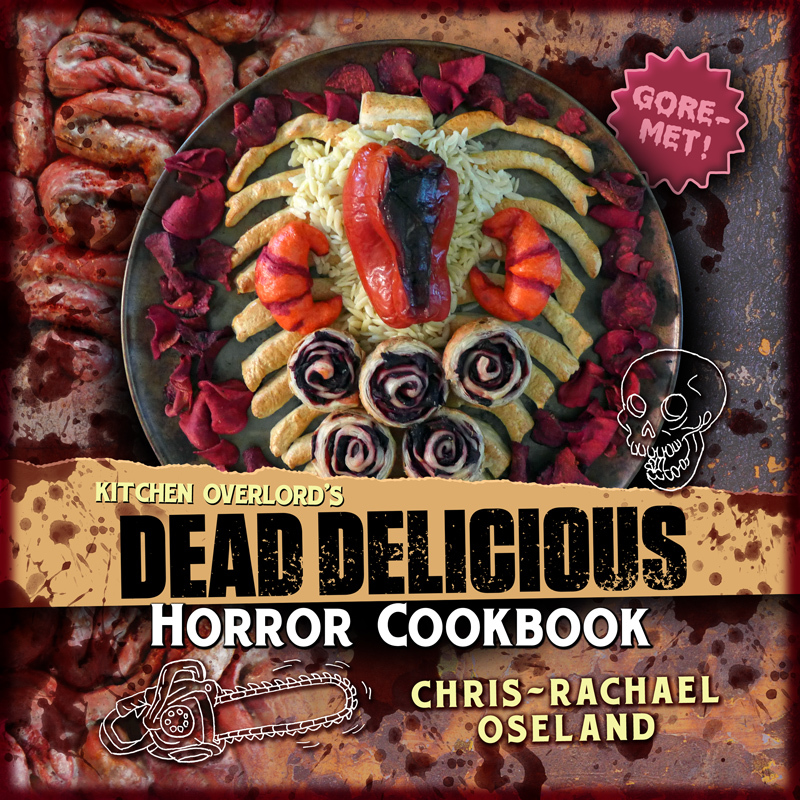 Pile a tablespoon of filling in the middle and pinch the edges closed with a fork. Feel free to decorate the tops with shapes cut out from extra dough. Bake the smaller, folded pies at 400F for 20-25 minutes, or until golden brown. * Technically, you can make these vegan by substituting coconut oil (or the vegan cooking oil of your choice) for butter. 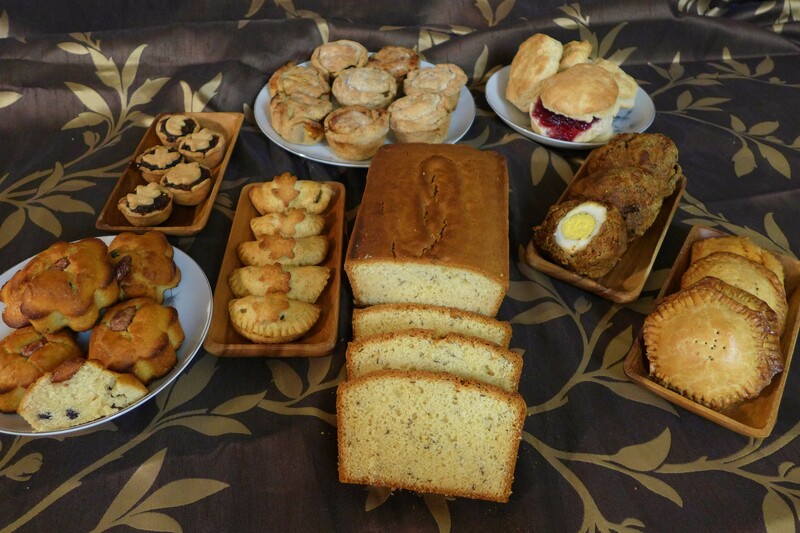 I tried, hence the huge difference in color between the large, cupcake sized, oil based pies and the small, teatime buttery ones. 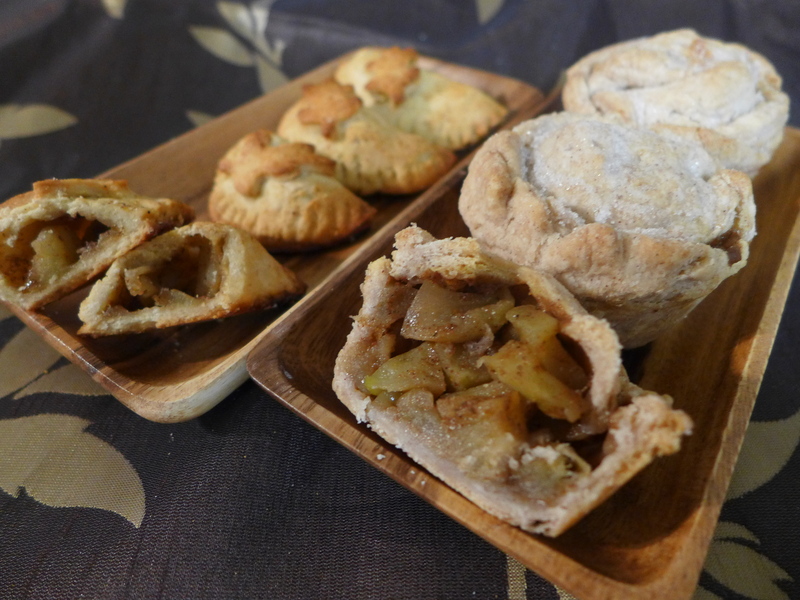 Even with the addition of extra spices, the oil based pies were notably less flavorful. The crust was also quite a bit more fragile and prone to falling apart in your hand after 2-3 bites. My oil crusts have held up well as small, folded, half moon sized pies, but they’re just not sturdy enough for something larger.